Active Server Pages(ASP), also known as Classic ASP, is a Microsoft’s server side technology, which helps in creating dynamic and user friendly Web pages.It uses different scripting languages to create dynamic Web pages, which can be run on any type of browser. 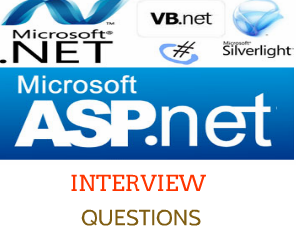 ASP.NET is a specification developed by Microsoft to create dynamic Web applications, Web sites, and Web services. It is a part of .NET Framework. You can create ASP.NET applications in most of the .NET compatible languages, such as Visual Basic, C#, and J#. The basic difference between ASP and ASP.NET is that ASP is interpreted; whereas, ASP.NET is compiled. This implies that since ASP uses VBScript; therefore, when an ASP page is executed, it is interpreted.ASP has Mixed HTML and coding logic.Limited OOPS support.On the other hand, ASP.NET uses .NET languages, such as C# and VB.NET, which are compiled to Microsoft Intermediate Language (MSIL).Variety of compilers and tools available including the Visual studio.Net. What are the types of validation controls in Asp.net ? A namespace is a method of organizing a group of assemblies, classes, or types. A namespace acts as a container—like a disk folder—for classes organized into groups usually based on functionality. C# namespace syntax allows namespaces to be nested. What are the namespaces In .NET ? A variable can be defined as a meaningful name that is given to a data storage location in the computer memory that contains a value. Every variable associated with a data type determines what type of value can be stored in the variable . A constant is similar to a variable except that the value, which you assign to a constant, cannot be changed, as in case of a variable. Constants must be initialized at the same time they are declared. what is Required Field Validator? It checks whether the control have any value. It is used when you want the control should not be empty. It checks if the value in validated controls is in that specific range. It checks that the value in controls should match some specific value. What is Regular Expression Validator? When we want the control, value should match with a specific regular expression. It is used to define user defined validation. What are the types of Cookies in Asp.net? What is the difference between Session cookie and Persistent cookie? Session cookie Resides on the client machine for a single session until the user does not log out. Persistent cookieResides on a user’s machine for a period specified for its expiry, such as 10 days, one month and never. The user can set this period manually. ViewState is a .Net mechanism to store the posted data among post backs. ViewState allows the state of objects to be stored in a hidden field on the page, saved on client side and transported back to server whenever required. Authentication is the process of identifying users.Authentication is identifying/validating the user against the credentials (username and password) and Authorization performs after authentication. Authorization is the process of granting access to those users based on identity. Authorization allowing access of specific resource to user. what is the difference between Server-side and client-side code? Server side code is executed at the server side on IIS in Asp.NET framework, while client side code is executed on the browser. What are the components of web form in ASP.NET? What is the difference between a Web Service and a Web server? Web Service uses custom code to provide functions to client programs located somewhere on the Internet. A Web server listens for Internet requests, such as HTTP or SOAP requests, and responds with files. Most Web Services use a Web server to "feed" them with requests from clients and to "push" data back to client programs. What method is used to bind data items to an ASP.NET Web control? Marshaling is used when an object is converted so that it can be sent across the networks or across applications domains. The DataGrid Web server control is a powerful tool for displaying information from a data source. It is easy to use; you can display editable data in a professional-looking grid by setting only a few properties. At the same time, the grid has a sophisticated object model that provides you with great flexibility in how you display the data. Output Caching : stores the responses from an asp.net page. Data Caching : is Programmatic way to Cache objects for performance. What is the base class of Asp.net? What is Common Language Runtime? What are Cascading style sheets ? Cascading style sheets (CSS) collect and organize all of the formatting information applied to HTML elements on a Web form. Because they keep this information in a single location, style sheets make it easy to adjust the appearance of Web applications.